Why Graduate When You Have No Choice But to Dive? I imagine some of you attended talks and ceremonies over the weekend that fell in the “You Can Change the World” category. Your parents and grandparents also heard such speeches. Before that though, they woke up to an alarm clock and ironed their clothes in order to be there on time and lookin’ spiffy. They HATED it. You too woke up to an alarm that morning, ironed your clothes, and hated it. Still think you can change the world? Good luck with that. 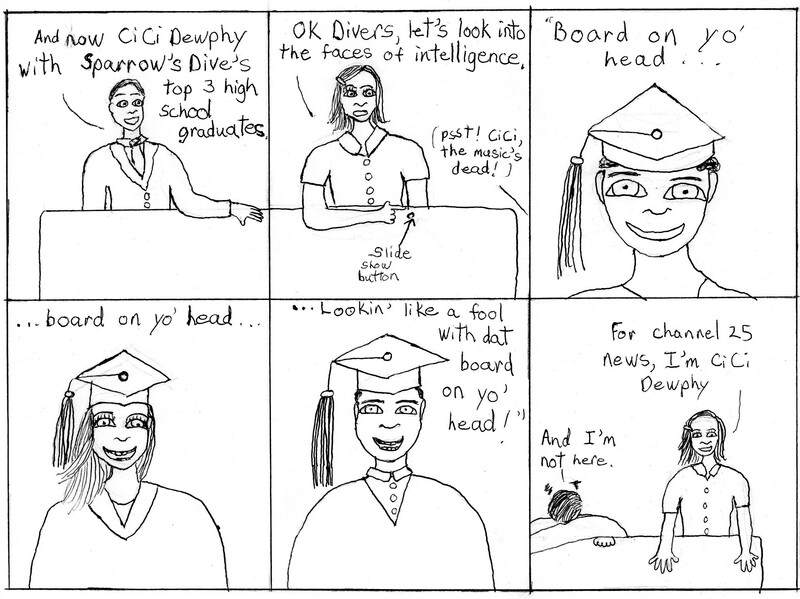 This entry was posted in comic strips and tagged comic strip, graduation, mortar board, news, news cartoon, news comics, newscast, robe. Bookmark the permalink. 5 Responses to Why Graduate When You Have No Choice But to Dive? A year has passed since high school graduation, luckily the word has changed me some for the better. It’s clear, though I think it was at the time, that I’m not meant to change the world. Thanks for writing a post that has me thinking! It was a compliment, I was saying what it got me thinking about.. Kinda off the actual point but I liked it and it got me thinking. Thanks! I guess I was trying to say that the people who do change the world don’t always make the best or most necessary changes. I mean, streaming video and e-mail on your phone? That’s great, but all I wanted was flexible hours at work and an alarm that doesn’t make me think the house is burning down. I’m constantly surprised at what is and is not too much to ask. Can put a man on the moon but some simple things remain to be unavailable..
thank you for explaining, I completely get it now. I’m blonde forgive me.